"Make the Call .. Stay Anonymous" -- and make a difference !!!! Los Angeles: CrimeReports, creator of the National Crime Map, today announced the launch of the TipSubmit™ Mobile application for Android™ and iPhone™. This application is the first mobile application that allows the public anonymously submit tips to law enforcement agencies including LAPD to help solve and prevent crime. Users of this application may now submit secure and anonymous tips to Crime Stoppers programs, law enforcement agencies or school safety officers and administrators. The new mobile application augments the existing TipSoft tools that allow the public to submit anonymous tips via phone, Web and Short Message Service (SMS) Text-a-tip. The application offers more powerful options than SMS Text-a-Tip, because it has the ability to use Global Positioning System (GPS) to auto-locate the nearest agency or to select an agency manually. Community members now can attach images and video clips to tips. The application also makes it possible to establish an anonymous, ongoing, two-way dialogue and real-time chat with the receiving agency. There is no cost to the public to use this application. To learn more or download the TipSoft application, visit Tipsoft.com or visit the Android™ Market or iTunes™ App Store. Community members can also continuously contact Crimestoppers at 1-800-222-TIPS ( 800-222-8477 ) to report crimes anonymously. Tipsters may also contact Crimestoppers by texting to phone number 274637 (C-R-I-M-E-S on most keypads) with a cell phone. For more information, contact LAPD Crime Stoppers coordinator at 213-484-6710 or LAPD Media Relations Section at 213-86-5910. December 16, 2009 -- Los Angeles Community Policing welcomes the launch of the Los Angeles Regional Crime Stoppers organization, as yet another regional partner in the fight against crime. I was delighted to have been personally introduced by my old friend and community policing partner Luisa Ashley, Mothers of Murdered Children, to some of her fellow 2009 Members of the Board, and to Executive Director Mark Speer, several months ago. I'm happy to recommend this program, which has been proven around the country as one that can make a real difference in public safety by engaging community members in providing the essential TIPS that often provide the key element in solving a crime. There are now more than 300 Crime Stopper programs worldwide. Please see the additional links we've provided above to find one near you. Callers can remain anonymous and are eligible to receive a cash reward if the information given leads to an arrest or criminal filing of a felony or misdemeanor offender. Crime Stoppers uses a three part approach to solving crimes. The first part of the program is to empower the community by providing a safe way to report criminal activity. Secondly, Crime Stoppers partners with all forms of media in the Los Angeles region to inform the community on how to anonymously report crimes. Law Enforcement is the final part of the triangle; they follow-up on tips from community members. Calls are received at a Call Center using a toll free number: 1-800-222-TIPS (8477). All phone lines are encrypted and no phone calls are ever recorded. Tips are then sent onto LA Crime Stoppers for further evaluation. By guaranteeing a caller's anonymity, Crime Stoppers allows the caller to provide information without fear of retaliation. By offering cash rewards for information that leads to an arrest or criminal filing, the program encourages othewise relunctant callers to provide information. Crime Stoppers Programs are organized as a not for profit organization. A civilian community board of directors provides direction as to the financial and promotional activities of the program. The board of directors enhances the community involvement aspect, and its function is vital to the programs success. The Crime Stoppers program is funded by private donations and annual fund raising events. NO TAX DOLLARS are involved . The reward money paid out by the program is from the fund raising and donations from concerned citizens and businesses. A community board of directors, made up of persons from throughout the area, meets on a monthly basis to evaluate arrests and to decide on the size of rewards to be paid, up to $1,000. Reward tips are paid out based on the severity of the crimes. Tips are eligible for rewards up to $1,000, but, despite this, many callers choose not to collect their rewards. Calls are received at a call center when using our toll free number 1-800-222-TIPS (8477). All calls, texts or emails received are encrypted; no one can capture the caller's location, identification, or phone number. Once the Call Center receives information, they pass tips onto Crime Stoppers. By guaranteeing a caller`s anonymity, through online, phone and text tips, Crime Stoppers allows the caller to give information in a positive atmosphere without the prospect of retribution. By offering cash rewards for information leading to indictment or arrests, the program encourages otherwise reluctant callers to provide information. Individuals looking to volunteer their time to LA Crime Stoppers can contact us via email at volunteer@lacrimestoppers.org . The answer is quite simply yes. 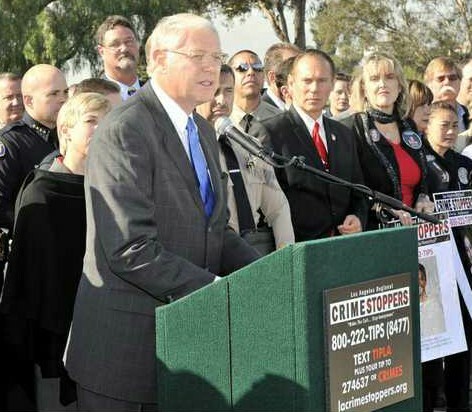 Since the start of Crime Stoppers, there have been over 850,000 arrests, resulting in over 1.2 million cases cleared. These arrests have resulted in over $1.9 billion in stolen property recovered and over $7 billion in drugs seized. LA Community Policing is delighted to have an active Regional Crime Stopper program in the LA County area. 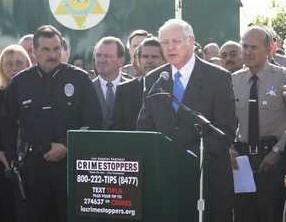 Los Angeles County Supervisor Michael D. Antonovich joined Sheriff Lee Baca, LAPD Chief Charlie Beck and police chiefs from more than 20 cities to launch a new public-private partnership that will offer rewards to anonymous tipsters who provide information leading to the apprehension and prosecution of criminals. and Sheriff Lee Baca launch "Crime Stoppers"
The Crimestoppers program was started in 1976 by a young detective in Albuquerque, N.M., who was frustrated by the number of unsolved cases in his jurisdiction. The detective reached out to the community, media and law enforcement agencies for help. This new partnership helped the young detective solve a murder he was investigating within 72 hours. There are now more than 300 Crime Stopper programs worldwide.